Last week we made a short trip to Spain with the Rotterdam Philharmonic. 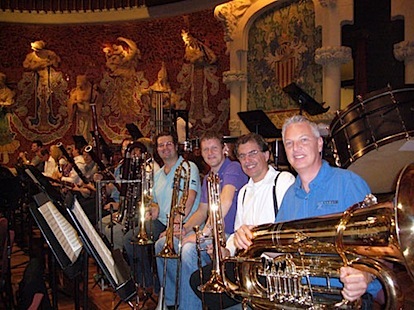 We played Mahler 9 in both Barcelona and Murcia. it was nice for me to be able to finish the Mahler 9 concerts after being ill for a week. because of a bad flu. Still a bit weak I joined the orchestra for our last two performances of this period. The PALAU DE LA MUSICA in Barcelona is a beautiful hall, great decorations but has not the greatest acoustics. Still it was nice to play there and have the time to enjoy some nice Tapas near the Ramblas. The weather was so nice and Barcelona is just an amazing city! From Barcelona it was on the Murcia. Nice hall and also a nice old centre of the town. Two good concerts which I was able to play again with full energy! 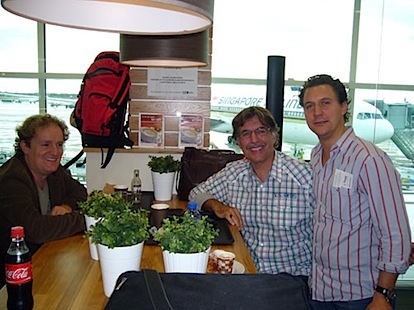 Arno Piters from the Royal Concertgebouw Orchestra on Murcia airport. It is always nice to see how are you doing!! I've studied in Barcelona as well as Murcia, the concert hall there is one of the finest in Spain! I am very happy to know that you are doing great as always!! Miss you, one hug from Santiago de Chile!